Photo of Christopher Carrizal (inset) The Twin Peaks restaurant, the scene of a motorcycle gang shootout, is seen May 18, 2015 in Waco, Texas (Photo by Erich Schlegel/Getty Images). Jury selection is underway in the first trial stemming from a deadly 2015 shootout between bikers and police at a Central Texas restaurant. The selection process began Tuesday in the Waco trial of Christopher "Jake" Carrizal. The Dallas chapter president of the Bandidos motorcycle club is the first to stand trial of 154 bikers indicted after the shootings that killed nine people and wounded 20 others outside a Waco restaurant. The defendants face felony charges of engaging in organized criminal activity. 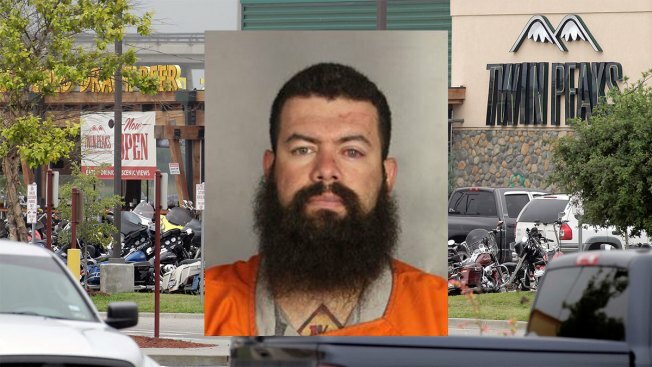 Investigators say motorcycle clubs in May 2015 were meeting at a Twin Peaks restaurant when a fight erupted between the Cossacks and the Bandidos, which the FBI categorizes as an outlaw motorcycle gang. The fight spilled into the parking lot as police tactical officers responded with rifle fire.